The Bioblitz at the River Park was held on 26th and 27th May with the recorders also coming for a site induction on 22nd May and the mammal trapping commenced on 25th May. Ron Warne, from Wirral Wildlife led the mammal trapping in two locations: grassland and woodland. Five volunteers took part over the three days, three of whom were new to mammal trapping so learnt the basics. Four wood mice were caught in each location! This was the first time traps had been placed in the park. ​On 26th May two classes of Y3/4 from Church Drive primary school came on a habitat tour. There were 60 children with 8 staff and they saw the skylarks displaying and the kestrels hunting. In addition to identifying plants by their scent, they saw several species of bees and ladybirds and were able to identify some with the guides provided by Fields Studies Council. The life cycles of these insects was also demonstrated. The outline plan for the session will be used as evidence to inform our Heritage Lottery Fund bid which includes the role of a part time Education Officer here. Recorders both from Wirral Wildlife and Record were active both days in the park. Carl Clee recorded a Large Garden Bumble Bee-this is the second record for the River Park and these are the only records for this species in Cheshire. He is planning to start a monitoring programme. The evening bat walk was well attended and the moth trappers set up during the walk. One of the children brought his grandmother back in the morning to see the moths. Ron Thomas brought his night vision recording equipment to film the bats. The noctule bats gave a tremendously noisy display with a real feeding frenzy! Everyone was very impressed. The moth trapping continued until midnight. The catch was really interesting and all four moth trappers are keen to establish regular sessions here with an extended time. One of the real benefits was that Paul and Nigel, both local enthusiasts were able to meet the other more established recorders and learn from them. It was the first time Paul had trapped moths outside his own garden! This friendship and collaboration will hopefully continue. 8.30am - Meet the moths at Event hub. 10.00 - 4.00pm stalls and activities at the event hub plus wildlife ID stations open. 10.30am - 12noon. Flower Walk. The moths took over the office in the morning with Ron Thomas photographing them in naturalistic settings. Some photos will be included in the report. The full record list is with Record for their report. The bird walk was led by Matt Allmark from Cheshire Wildlife Trust and he was guided around the park by our regular walkers and volunteers, as this was his first visit. He was so impressed that he’s keen to return. The walkers all spoke enthusiastically about his knowledge and interpretation of the birds. Hilary Ash from Wirral Wildlife led the Wild Flower walk, aided by Mathilde Baker-Schommer. An animal trail, designed and built by service users from Autism Together, was displayed in the trees for younger children to spot. 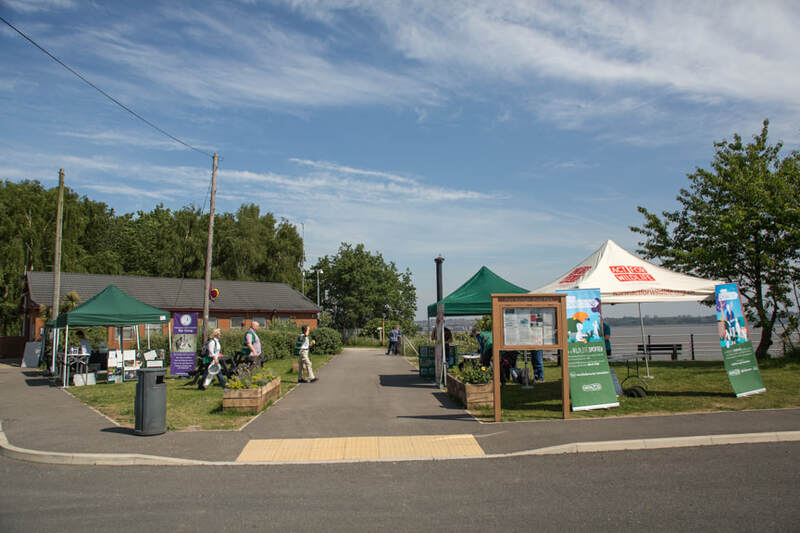 There were gazeboes and stands from partner organisations: Wirral Wildlife, RECORD, Chester Zoo, Merseyside and West Lancashire Bat Group to educate and promote wildlife ID and recycling. 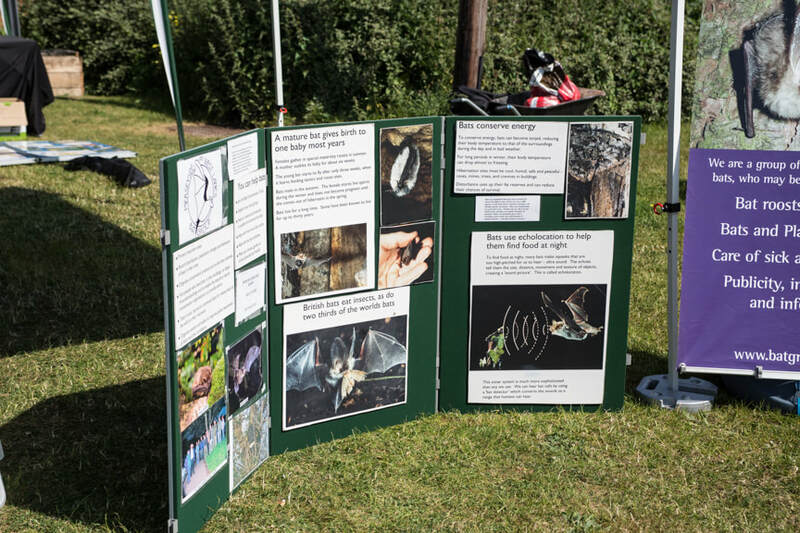 Bat Conservation Trust and Field Studies Council provided a wealth of resources for the schools to take away and for the public both on the bat walk and on the Saturday events. This will benefit a wider audience. The Kent bat box design was assessed by Charlie Liggett, from Merseyside and West Lancashire Bat group and some minor modifications can be made to make them suitable for both noctule and pipistrelle bats. The event ensured a greater awareness, by our visitors and volunteers, of the value of the site for wildlife. Record staff spent their time recording, rather than putting records online, so this data is still being analysed. An advantage is that the Record staff and volunteers know the site and are keen to work here again. They will help out at our third birthday celebration on 13th August by staffing a wildlife ID station. Record helped to provide an agreed habitat map of the park with the areas calculated to aid future management and recording. Also we are working with Chester Zoo on their Wildlife Connections programme as a result of meeting at this event. The support of our partners: Record, Wirral Wildlife and Friends of Ness Gardens were immeasurable. Their expertise and generosity with time was very impressive. We are very grateful to Merseyside Environmental Trust for their financial support.